Maybe they just have a song in their wires? In all seriousness, humming or buzzing in your lights can be maddening. Whether it’s coming from incandescents, fluorescents, or LEDs, the problem usually stems from vibration caused by the voltage applied. The vibration itself isn't always the fault of the bulb either, other devices on the same electrical line can lead to noisy lines or noisy light bulbs too. Usually, this hum is a fairly easy fix so long as you know what to look for, which is great since this is a common problem. Incandescents are usually very quiet bulbs. They rarely hum, and when they do it’s usually because a dimmer is installed on the same line. Triode for AC (TRIAC) dimming is the most common type of incandescent dimmer switch. TRIAC dimmers remove part of the voltage from the line to decrease the amount of energy reaching the light bulb. This leads to a constant “on/off” switching for the bulb that dims the light output. Unfortunately, the constant application and removal of voltage excites and cools the filament, causing vibration, which leads to that annoying buzzing or humming noise. Upgrading to a rough service bulb (typically used in kitchen appliances or commercial hardware) with a more supported filament will lessen that vibration and silence the hum. Likewise, a 130-volt bulb has a thicker filament which will also reduce buzzing. Both of these lamps have the added benefit of longer life-spans than a typical bulb, but cost a little more. Changing out your dimmer switches can also reduce or remove vibration. If your dimmer is being run at maximum wattage capacity, the internal wires can heat up and cause a very annoying buzz. At this point it’s a good idea to either use lower-wattage bulbs or upgrade to a dimmer with a higher wattage rating. Fluorescents are far more likely to hum or buzz than incandescents. Aside from flickering, buzzing is the most common issue we hear about when it comes to fluorescent lights. While this can be caused by a bad bulb or starter (if you have extras, you should try replacing those first to see if the buzzing stops), it’s usually caused by an aging ballast (the device used to regulate voltage for a fluorescent lamp). As with incandescents, a lot of buzzing comes from re-striking issues in the fluorescent arc when the lamp is cycled on and off. Constant re-striking happens when a ballast or lamp ages and can no longer regulate voltage properly. It can also be caused by extremely cold conditions. If replacing the lamp itself has not helped, try replacing your ballast. The ballast itself can often be noisier than any lamp. If you’re still using an older magnetic ballast or a ballast with a noise rating other than class-A, you will hear quite a bit of hum. Magnetic ballasts have metal plates which vibrate as well as an intense electromagnet field which can generate hum. Upgrading your ballast to a newer electrical ballast or to a ballast with a class-A rating can reduce or remove this hum entirely. LEDs lack a filament or firing arc so there are no “moving parts” to cause humming. Unfortunately, LEDs still suffer from electromagnetic (EM) hum caused by incorrect dimming or EM interference by other devices. If you notice that your lights only hum when the microwave is on, it’s an issue with EM interference and there isn’t much that can be done. But, if your lights hum when dimmed or installed into sockets connected to a dimmer, it’s simple to fix. LEDs do not dim the same way as incandescents. Simply cutting off a portion of the waveform will strain the driver within your LEDs and decrease the lifespan of the lamp. You should always make sure to get a compatible dimmer for your LEDs if available. Ensuring you have dimmable LEDs and using the right dimmer promotes the life of your LEDs and removes that terrible humming noise. If you are using LEDs that employ a separate driver, you might get hum or buzzing on your line from an incorrect driver. Similar to ballast issues in fluorescent lights, double check any external drivers for compatibility or aging issues. A few other elements of your lighting can cause buzzing or humming. The most dangerous are electrical shorts. Small shorts in wires or carbon build-up on electrical contacts can lead to similar “on/off” striking and electrical humming or buzzing. If you suspect the cause to be a short, you should get an electrician to check and repair the damage immediately. Another source is in loose fixtures. Sometimes something as simple as a loose screw can lead to vibration in the fixture, which causes similar, if a more metallic sounding, humming from the light fixture. Double check your fixture’s supports if you can’t find any other problems: it might be just that simple. Whether it’s a dimmer, a ballast, or just an incompatible bulb, humming or buzzing can be fixed pretty easily. 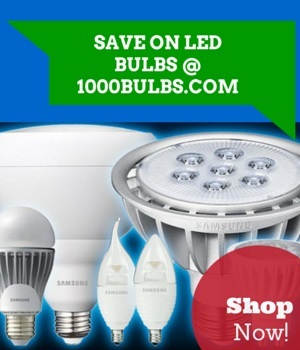 Fixes range from a simple bulb replacement to more expensive tactics like replacing a dimmer or circuit. If you’ve any other questions, or your own buzzing story, share it with us in the comments. Or, you can always contact us through our social media with questions, comments, or just pictures using Facebook, Twitter, Google Plus, LinkedIn, Pinterest, or Instagram!